Buying a home? It is probably the most expensive purchase you will ever make. This is no time to shop for a cheap inspection. The cost of a home inspection is very small relative to the value of the home being inspected. The additional cost of hiring an InterNACHI-certified inspector is almost insignificant. You have recently been crunching the numbers, negotiating offers, adding up closing costs, shopping for mortgages, and trying to get the best deals. Do not stop now. Do not let your real estate agent, a “patty-cake” inspector, or anyone else talk you into skimping here. InterNACHI-certified inspectors perform the best inspections by far. InterNACHI-certified inspectors earn their fees many times over. They do more, they deserve more, and — yes — they generally charge a little more. Do yourself a favor… and pay a little more for the quality inspection you deserve. Licensing of home inspectors only sets a minimum standard. Much like being up to code, any less would be illegal. Imaginary people, children, psychics (who claim to “sense” if a house is OK) and even pets can be home inspectors. InterNACHI, the International Association of Certified Home Inspectors, front-ends its membership requirements. have access to a Client Satisfaction Survey. So, the next time you need to refer your clients to home inspectors, make sure they are members of InterNACHI. Most people don’t know how easy it is to make their homes run on less energy, and here at InterNACHI, we want to change that. Drastic reductions in heating, cooling and electricity costs can be accomplished through very simple changes, most of which homeowners can do themselves. Of course, for homeowners who want to take advantage of the most up-to-date knowledge and systems in home energy efficiency, InterNACHI energy auditors can perform in-depth testing to find the best energy solutions for your particular home. Knowing about potential problems with a home before you list it will prepare you to deal with requests from potential buyers. A home inspection can be nerve-wracking for the seller, especially in a market like this. Potential buyers aren’t afraid to demand that long lists of problems be addressed before the sale is finalized. This is happening more and more frequently, as I’m sure you’ve witnessed. No matter how much you do to prepare the home, realize that a home inspector is always going to find something wrong. More times than not, problems are minor and easy enough for the seller to either fix or credit towards the sales price. It’s the not knowing and discovery of major deficiencies, coupled with the unwillingness of the seller to negotiate — that can kill a deal. The thorough way to prepare is to have your seller get an unbiased inspection before you list the home on the market. A pre-listing inspection will tell you exactly what needs to be fixed before you begin your search for a buyer. But sellers often don’t spend the money for a pre-listing inspection for numerous reasons. Whether it be financial or the belief that there is nothing wrong with their home, a pre-listing inspection will address everything that is ultimately going to be addressed – and usually at a fraction of the cost. A home owner should walk out of the house, turn around and walk back in with fresh eyes as if they were the buyer. Inspectors will be looking for problems with the home’s mechanical systems such as HVAC, electrical & plumbing. Signs of water damage, mold, leaks, termites and structural or mechanical problems will always be a top priority. They’ll also look at projects the homeowners have done themselves, including for example, that upgraded electrical outlets are grounded and working properly, ceiling fans were installed correctly and decks were built with proper structure. As much as you can, have your seller get their house as ready as possible by fixing the problems or at minimum, have a plan on how you will address them when the buyer brings them up. Little things are just as important as the major things I have mentioned. Make sure that everything is clean and operable such as gutters, windows and peeling paint. Also, replace any leaky faucets, broken windows and squeaky doors and cabinets. You might also want to have the septic tank pumped and the furnace and air-conditioning systems serviced (as the should be every year). Inspectors vary in experience, ability and thoroughness, but a good inspector should examine certain components of the home you want to purchase and then produce a report covering his or her findings. The typical inspection lasts two to three hours and you should be present for the inspection to get a firsthand explanation of the inspector’s findings and, if necessary, ask questions. Also, any problems the inspector uncovers will make more sense if you see them in person instead of relying solely on the snapshot photos in the report. Exterior walls – The inspector will check for damaged or missing siding, cracks and whether the soil is in excessively close contact with the bottom of the house, which can invite wood-destroying insects. However, the pest inspector, not the home inspector, will check for actual damage from these insects. The inspector will let you know which problems are cosmetic and which could be more serious. Foundation – If the foundation is not visible, and it usually is not, the inspector will not be able to examine it directly, but they can check for secondary evidence of foundation issues, like cracks or settling. Garage or carport – The inspector will test the garage door for proper opening and closing, check the garage framing if it is visible and determine if the garage is properly ventilated (to prevent accidental carbon monoxide poisoning). If the water heater is in the garage, the inspector will make sure it is installed high enough off the ground to minimize the risk of explosion from gasoline fumes mingling with the heater’s flame. Plumbing – The home inspector will check all faucets and showers, look for visible leaks, such as under sinks and test the water pressure. He or she will also identify the kind of pipes the house has, if any pipes are visible. 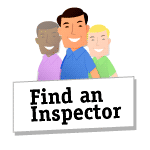 The inspector may recommend a secondary inspection if the pipes are old to determine if or when they might need to be replaced and how much the work would cost. The inspector will also identify the location of the home’s main water shutoff valve. Electrical – The inspector will identify the kind of wiring the home has, test all the outlets and make sure there are functional ground fault circuit interrupters (which can protect you from electrocution, electric shock and electrical burns) installed in areas like the bathrooms, kitchen, garage and outdoors. They will also check your electrical panel for any safety issues and check your electrical outlets to make sure they do not present a fire hazard. Heating, ventilation and air conditioning (HVAC) – The inspector will look at your HVAC system to estimate the age of the furnace and airconditioner, determine if they function properly and recommend repairs or maintenance. An inspector can also give you an idea of the age of the home’s ducting, whether it might have leaks, if your home has sufficient insulation to minimize your energy bills and whether there is any asbestos insulation. Water heater – The home inspector will identify the age of the heater and determine if it is properly installed and secured. The inspector will also let you know what kind of condition it is in and give you a general idea of how many years it has left. Laundry room – The inspector will make sure the laundry room is properly vented. A poorly maintained dryer-exhaust system can be a serious fire hazard. Bathrooms – The inspector will check for visible leaks, properly secured toilets, adequate ventilation and other issues. If the bathroom does not have a window and/or a ventilation fan, mold and mildew can become problems and moisture can warp wood cabinets over time. A home inspection can’t identify everything that might be wrong with the property – it only checks for visual cues to problems. For example, if the home’s doors do not close properly or the floors are slanted, the foundation might have a crack – but if the crack can’t be seen without pulling up all the flooring in the house, a home inspector can’t tell you for sure if it’s there. Once you have the results of your home inspection, you have several options. If the problems are too significant or too expensive to fix, you can choose to walk away from the purchase, as long as the purchase contract has an inspection contingency. A home inspection will cost you a little bit of time and money, but in the long run you’ll be glad you did it. The inspection can reveal problems that you may be able to get the current owners to fix before you move in, saving you time and money. If you are a first-time homebuyer, an inspection can give you a crash course in home maintenance and a checklist of items that need attention to make your home as safe and sound as possible. Don’t skip this important step in the home-buying process – it’s worth every penny.